The first in a long line of imaginatively titled BBC Test Cards,this is Test Card A. It was broadcast in the late 1940's and is credited as the world's first television test card to be transmitted. 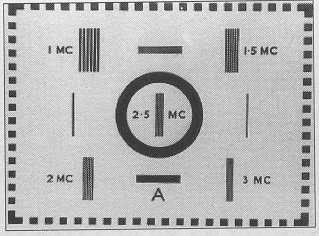 The 2.5 MC frequency grating was of most interest to engineers, hence its location in the centre of the circle. Although a great improvement on anything previously available, Test Card A and it's near relative, card B was criticised for not having sufficient testing features. 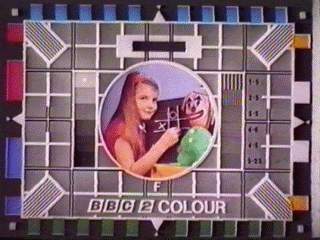 Test Card B has been lost! A photograph exists of a studio, with a partial view of Test Card B on a stand. George Hersee described it in his 1967 work, but it is believed that no copies of the full card remain in existence, unless of course, you know better? It was similar to card A but with an extra greyscale strip below the circle. The letterbox just above "A" moved to the top of the card. It was never actually broadcast, but was used for camera line-up at Alexander Palace. 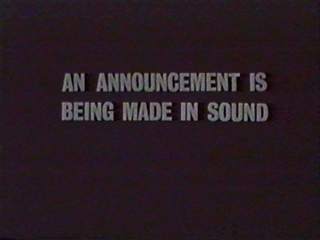 This first made an appearance in 1948 and was used by the BBC and other agencies into the 1970's. One problem with Test Card C was that it wasn't created from a specification. This led to numerous variants, each local transmitter held a different version. It was however immensely popular. 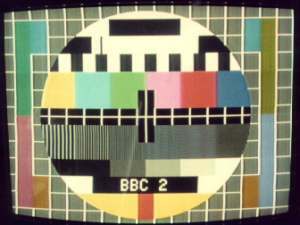 In 1964, field tests for the forthcoming BBC2 used this SMPTE test card. 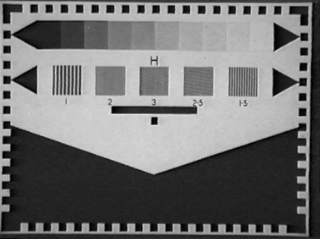 Test Card D made its first appearance in 1964 in glorious 405 line B&W accompanied by state of the art mono sound. It replaced test Card C, on which the design was based. This was the first Test Card to be produced in response to a technical specification. 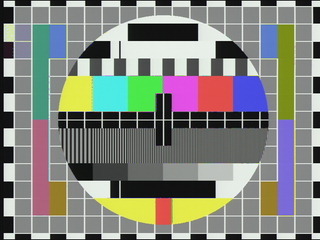 Test card E, very similar to D, but with modified "sinusoidal" frequency gratings for the new 625 line service on BBC 2. Whilst being correct from an engineering viewpoint, the TV trade didn't like the way this image looked on their sets and complained vociferously. 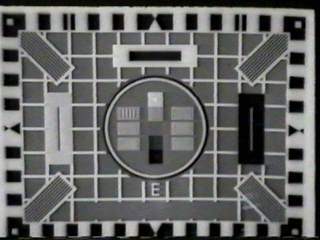 Test Card E was withdrawn after only one days transmission in April 1964. It has since been used abroad. 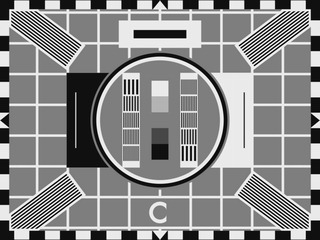 The replacement for test card E was this, a modified version of Test Card C.
It was used on BBC 2 from its birth in 1964 until colour was introduced in 1967 and Test Card F took over. The most famous test card of all, Test Card F, still in use today by the BBC and used in 30 other countries. Designed by George Hersee and featuring his daughter Carole Hersee, it made its first appearance on BBC2 in 1967. 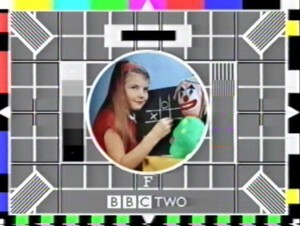 Left is the original version of Test Card F, BBC2. Did you know that the X on the noughts and crosses board was included to indicate the approximate centre of the card? The key differences between the original and today's version are the labels for the frequency grating and the addition of a colour bar at the top. In 1984, Test Card F was converted to an electronic version. However this example pre-dates this, and is a strange hybrid from 1981. 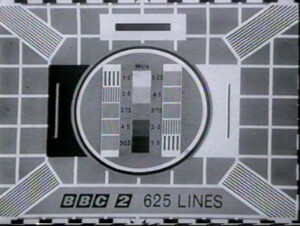 The Test Card is generated by a slide scanner, but the identification is electronically overlaid, as the slide says "BBC2". The colour bars have been introduced at the top, and in this example have been poorly superimposed. When the electronically generated version first came in to use, there was no station identification. It was several months before a new character generator became available to overlay the ident caption, which, when it arrived, was very plain. 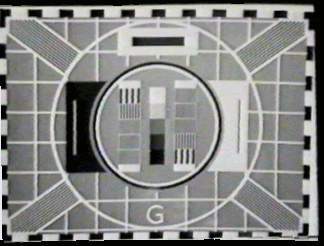 Test Card G used by the BBC at various times, although only broadcast occasionally. It is a slightly modified version of the standard Philips PM5544 test pattern. 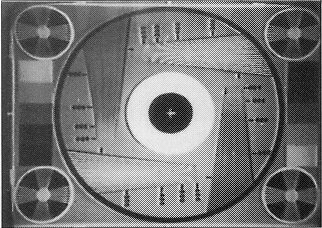 It was the first "electronically generated" test card from the BBC. Here's an off-screen photograph of Test Card G as seen on BBC2 in the seventies. Test Card G also had a few seasonal variations, such as when BBC engineers decorated TCG with a Christmas BBC2 caption. Others may remember this "Test Card G", from Pye. It is a modified Test Card C with an extra outer circle. Unfortunately there was often confusion as broadcasters, television manufacturers and other trade organisations gave different cards the same names. Test Card H at the BBC. This was never broadcast, but was used internally for testing purposes. 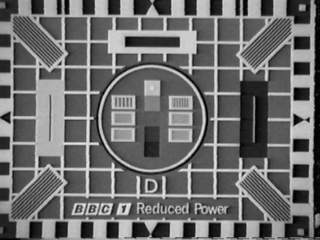 Often the test card captions would provide additional information as this "Reduced Power" version of Test Card D demonstrates. 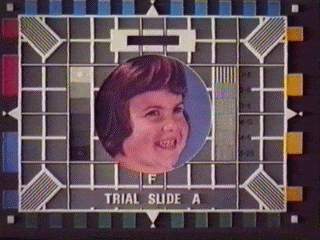 An early variant of Test Card F, before the famous picture of Carole Hersee was chosen. Another very early non-broadcast version of Test Card F. I don't know what these were used for, or when they were used. 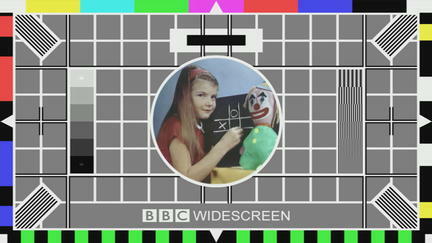 A New BBC Test Card? 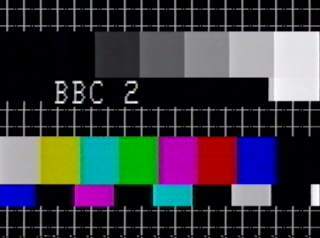 This electronically generated image was broadcast on 21st June 1997 on BBC2 between 3am and 4am. It was accompanied by a 4-tone test tone, ranging from extremely low frequency to a very high shrill. BBC2 stayed up all night on this occasion, during the rest of the night the normal TCF and tone was used. It was also broadcast between 0329 and 0344 on 5th Oct 1997 from Crystal Palace. On 5th Oct 1997, whilst BBC2 was broadcasting the above, BBC1 was showing this slightly modified Test Card G. It was accompanied by the standard BBC1 stereo tones. For both of these, sound was in NICAM but there was no teletext or PDC signals. 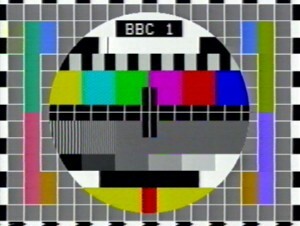 BBC1 and BBC2 both switched over to these images at the same time, and reverted back to Test Card F at the same time. It is thought they were broadcast only from Crystal Palace, unless of course you spotted them elsewhere? They were broadcast as part of a switching test by the BBC. If there were ever a major incident at Television Centre, London, BBC Network Television would evacuate to Pebble Mill, Birmingham. A switch would be thrown so that Birmingham were in control of the network, where they would then attempt to run as normal a service as possible. These two test cards were transmitted from Birmingham, in order to test that the switching facility worked. With the launch of the new BBC logo, both test cards were changed to reflect the new caption. These were both first seen from 0630 on 4th October 1997 and last seen on BBC1 at 0706 on 9th November 1997. Unfortunately BBC1 now broadcasts 24 hours a day, showing the new rolling news channel instead of closing down overnight. 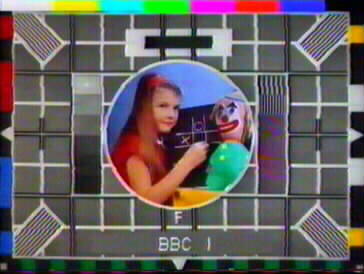 Therefore we have probably seen the last test card on BBC1 and the days of the test card on BBC2 are numbered. 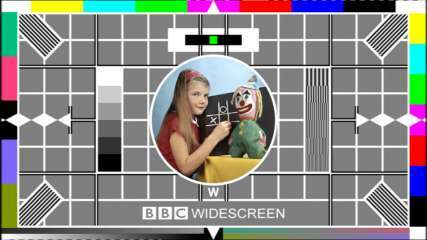 BBC2 already stays up all night with the Learning Zone, with opportunities for the test card limited to early morning weekends and educational holidays. Broadcast on BBC1 on 18 March 1993 as part of "Comic Relief" week. Anyone know who the would-be Carole Hersee is? 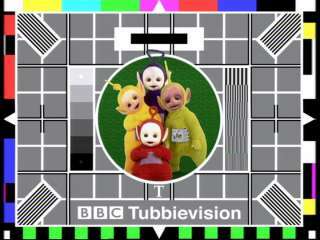 Seen in and around Television Centre, but not by the public, the Tellytubbies launch their own test card. This early widescreen Test Card was broadcast by the BBC as part of digital tests on Astra 1D in mid March 1998. It does not have a designation letter, although it is clearly Test Card F adapted. Test Card J replaced TCF, both sport a new centre image, rescanned from the original photgraphic work and showing much more of the picture. 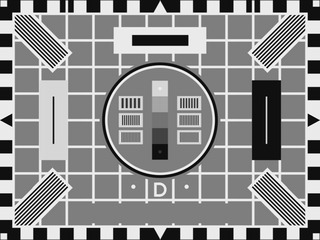 Test Card J has been broadcast on BBC2, Test Card W was shown on "Have I Got News For You" and on News 24 during the BBC Power Failure on 20th June 2000.